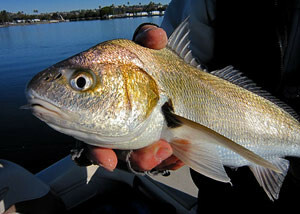 San Diego Bay and Mission Bay provide easily accessible year round fisheries for multiple species. The principle catch is the hard pulling spotted bay bass with halibut, yellowfin croaker, shortfin corvina, sand bass, kelp bass (also known as calico bass), mackerel, and jack smelt also readily taking the fly. 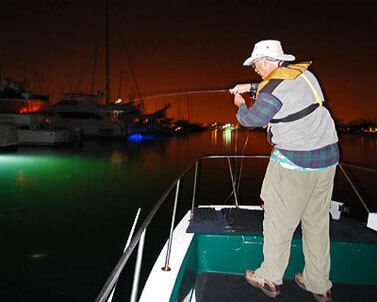 Bonito, barracuda, bonefish, spotfin croaker, and assorted rays are regularly caught. These waters are ideally fished from some type of water craft. Aside from boats, many anglers utilize kayaks. Pontoon boats and float tubes may be used in some protected areas where tidal currents are not as strong as in the main channels and stand up paddle boards are becoming more popular as fly fishing platforms. There are a few areas on San Diego bay that may be waded or fished from shore but Mission Bay is much more accessible to the angler afoot. There are four public launch ramps on San Diego Bay and five on Mission Bay. Skiff rentals are available on both bays. You do not need to be a great fly caster to have success on the bays. If you can hit the water with the fly you can catch fish if fishing from a watercraft, making the bays an excellent venue for the novice. Casting skill and the ability to make longer casts are more important when fishing from shore. Skilled casters will be better prepared to deal with the wind and benefit from longer casts that keep the fly in the water but less skilled casters can be successful in most conditions. The sinking fly lines which are most commonly used can be a bit more challenging to cast than floating fly lines; most casters can get the hang of the basics in a few minutes. Most anglers fish the bays using 5wt through 8wt rods, with some even using 3wt and 4wt rods for smelt. Since most fish will weigh in at less than two pounds and not test your tackle, high end reels are not necessary. A simple click and pawl drag reel with 50 yards of backing will work fine most of the time even for the smaller bonito that make their way into the bays at times; however, most anglers opt for disc drag models. Spotted bay bass and halibut are most often taken near or on the bottom in 2 to 20 feet of water. Some type of sinking line with a sinking section of at least 24ft in length and a sink rate of about 4 inches per second (ips) will cover most situations. A traditional sink tip line with a 7 to 12ft tip can be useful in water 4 to 8ft deep if the current or drift speed is not too fast. An intermediate line is useful when fishing water 2-6 feet deep and even up to 10 feet in under mild tidal current conditions. A line with a sink rate of 6-8 ips is useful for water deeper than 12 feet and in fast current conditions. A wading angler will find a floating line paired with a 12 to 16 foot leader the ticket when wading the shallow gradient beaches of Mission Bay. When using sinking lines, tapered leaders are not necessary. A 4 to 8 foot length of 8 to 12 pound test monofilament (traditional nylon or flourocarbon) is all you need. Water temperatures range from the mid-50’s F to mid-70’s F so tropical lines are not required and in fact do not work well in our local waters most of the time. A wide range of fly patterns will work for bay species. 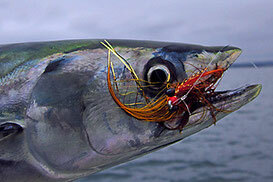 Many locals have created their own patterns for the bay but specialized flies are not required. 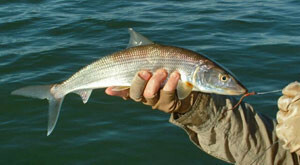 A chartreuse and white Clouser deep minnow will take all bay species over a wide range of conditions. Clouser minnows in many other color combinations also produce as well as Lefty’s Deceivers, Puglisi style baitfish flies, crab patterns, shrimp imitations, and bonefish patterns. Flies with orange and pink tones imitate the ghost shrimp and sometimes out produce other colors. 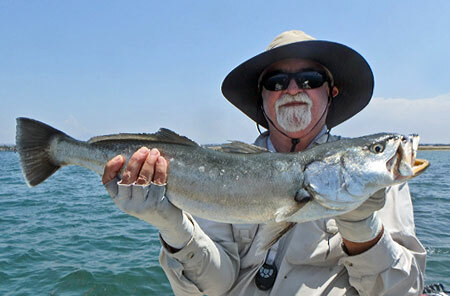 Shortfin corvina, mackerel, and bonito can sometimes be taken on topwater patterns. The water rarely gets rough on the bays, and at those times when it does the wind will cause the fishing to cease to be fun well before water surface conditions become a safety hazard. As such, boats as small as 12 feet in length can provide a serviceable platform for angling the bays. Much of the angling is accomplished by drifting over likely holding areas. A drift sock or drogue is a useful accessory that can extend many angling outings by slowing down a wind driven drift, making it easier to keep the fly near the bottom. A bow mounted electric trolling motor is helpful for working along channel edges or around boat docks.